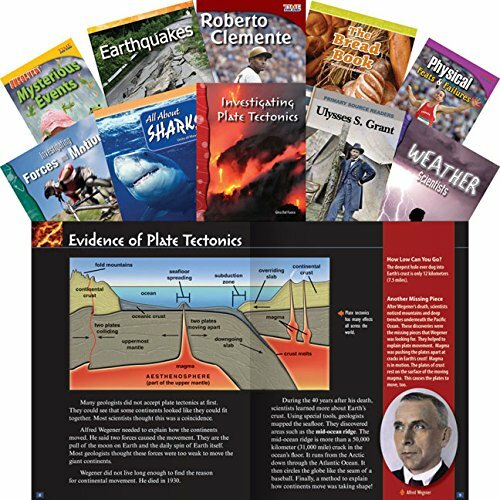 The selected titles in this 24-book Grade 4 collection provide students with an opportunity to gain adequate exposure to a range of appropriately complex texts and are aligned to the Common Core State Standards. Titles include: Robert E. Lee (Social Studies); Inside the World of Matter (Science); Ulysses S. Grant (Social Studies); Earthquakes (Science); Eco-Predictions (Math, Science); The Bread Book (Math); Pioneering Ecologists (Science); Weather Scientists (Science); Natural Disasters (Math, Science); Langston Hughes: Harlem Renaissance Writer (Social Studies); Survival! Jungle (Science); Hosting the Olympic Summer Games (Math); Strange but True: Bizarre Animals (Science); Unsolved! Mysterious Events (Science); Straight Talk: The Truth About Food (Science); Strange but True: Gross Anatomy (Science); Inside the Water Cycle (Science); All About Energy (Science); All About Sharks (Math, Science); Investigating Plate Tectonics (Science); Physical: Feats & Failures (Science); Investigating Forces and Motion (Science); A Day in the Life of a Cowhand (Social Studies); and Roberto Clemente (Social Studies).